We work with so many great people here at Everything Summer Camp, which is why we like to use this Blog as a platform every now and again to express our gratitude toward the awesome companies with whom we’ve formed excellent relationships! Today, we’re swinging our Vendor Spotlight over to shine on the stylish Real Kids Shades. Slip on a pair of Real Kids Shades Glide when the summer sun is shining bright! 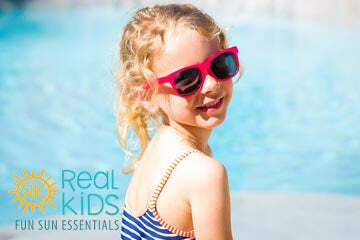 Around since 2002, Real Kids Shades has quickly developed and strengthened their reputation with their durable and protective products. These sunglasses, available in both, boys’ and girls’ styles, keep your eyes safe behind 100% UV lenses.Starting out with a simple mission, Real Kids Shades promised affordable, high-quality, 100% UV protective sunglasses designed for kids. And in their 16 years of business, they’ve grown to offer multiple sizes to provide a proper fit and protect kids from infancy to 12 years old. All their shades are manufactured from top-of-the-line, durable materials so they’re sure to provide a long-lasting product—after all, kids and the summer camp lifestyle have a tendency to be a little rough on camp gear and other supplies. We’re delighted to offer Real Kids Shades’ products on our one-stop camping gear shop. We offer the Girl’s Breeze Sunglasses, available in an assortment of cool colors to complement your clothing. And we also offer Boy’s Bolt Sunglasses with two-tone coloring for a super-cool look! Enjoy those brilliant days at camp with a pair of Real Kids Shades, found on the Everything Summer Camp main site! You can get a closer look at the girls shades by clicking here and check out the cool-looking shades for boys by clicking here. Make sure you’ve got your sunglasses for those bright, sun-shiny camp days and, as always, thanks for reading!